A few months ago, I was invited to preview some new collections from The Body Shop (including their holiday 2015 makeup) and while there was definitely lots to get excited about, I knew without a doubt that I would love their Spa of the World line the most. If you're like me and love a little pamper time, it's seriously all you need to turn your bathroom into a relaxing, blissful "spathroom." Inspired by ancient beauty rituals from around the globe, each product is made with natural ingredients and features The Body Shop's new packaging (the company has revamped a lot of their product lines to look more sleek and modern). I moisturize regularly and am always on the look out for the best body butters and creams to keep my skin in tip-top shape. The Hawaiian Kukui Cream ($35 CAD) features kukui seed oil which is supposed to be effective on even the driest of skins. 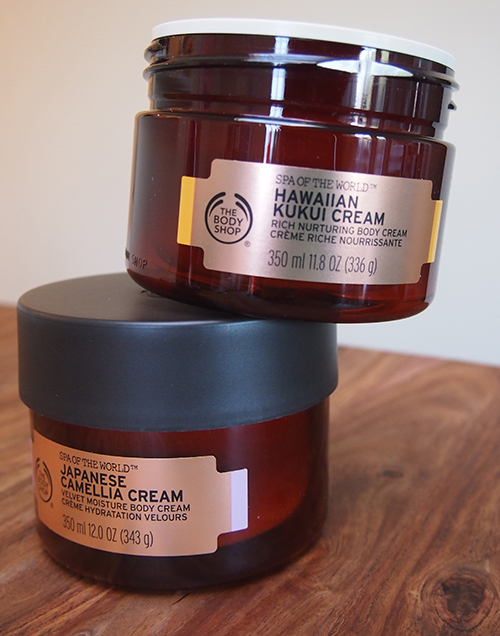 For a more delicate floral scent, the Japanese Camellia Cream ($35 CAD) is a great alternative. Both creams feel velvety soft, absorb easily and feel super rich and luxurious. The Egyptian Milk & Honey Bath ($20 CAD) is a new-to-me type of bath product. It's a creamy fragrant powder that you scoop under running water and swirl until it's dissolved for the ultimate in bath time relaxation. 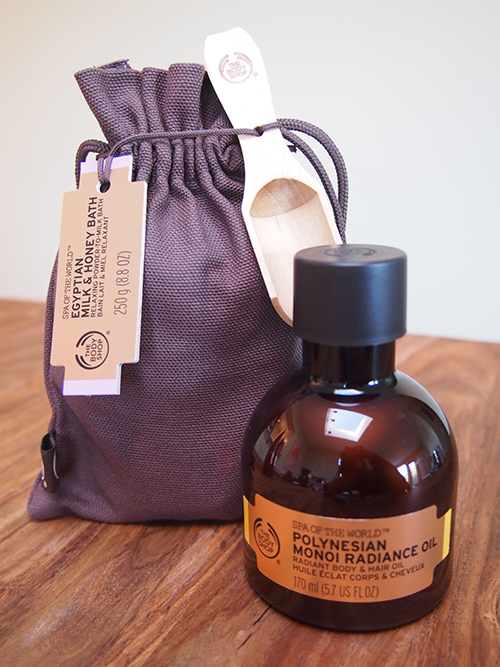 If you're looking for a multi-tasker, there's the Polynesian Monoi Radiance Oil ($20 CAD), made with a scented blend of coconut oil and tiare flowers that has apparently been used by the women of the Polynesian islands for two thousand years. It can be massaged into damp skin or combed through damaged hair (similar to MoroccanOil). Scrubs are a mainstay for me, especially in the winter months thanks to all the dry weather. 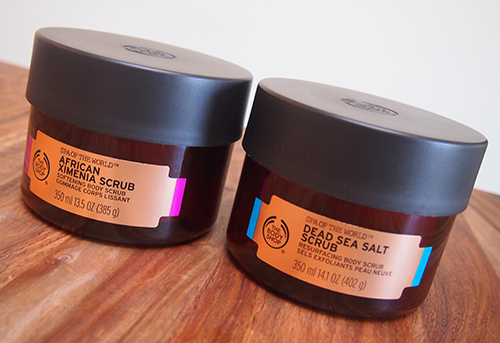 I'm familiar with salt scrubs like the Dead Sea Salt Scrub ($30 CAD), which delivers exactly as I thought it would. For something a little different, there's the African Ximenia Scrub ($30 CAD). Ximenia is a type of tree rich in oleic acid, often referred to as the "Tree of Life", and provides a much more gentle exfoliation than the Dead Sea Salt Scrub. For a truly spa-like experience, the Spa of the World line also includes two very indulgent clay body masks. 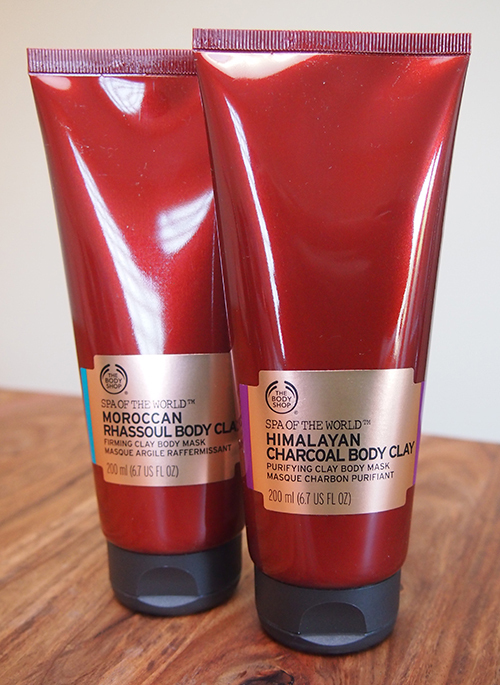 The Moroccan Rhassoul Body Clay ($22 CAD) tightens and firms, while the Himalayan Charcoal Body Clay ($22 CAD) features purifying charcoal for a radiant glow. Of course, it can be a bit awkward applying a body mask in the shower but The Body Shop is thankfully also offering a new Body Mask Brush ($10 CAD), which allows you to paint on thin layers of the masks in long strokes. Overall, I really like this new line -- there is a lot of variety and the products feel high quality. The price point is a bit higher than The Body Shop's other offerings but nothing unreasonable. Plus, you get a lot for what you're paying... the tubs of creams and scrubs are huge. With Christmas coming up, something from Spa of the World would absolutely make a great gift or stocking stuffer for a spa-loving friend... or you might just be tempted to buy a treat for yourself instead! ohhh these body clays sound fab for a bit of pampering time! wow sounds so luxe! xO! How exciting! That Hawaiian Kukui Cream sounds right up my alley. The new line sounded so nice especially all the different perfumes inspired by different locations in the world. Will need to go in the store to try it out.